This is the kind of product I'd like to see more of in the checkout zone at TJ's. They're far more healthy than treats like salted caramel or pb&j filled candy bars, and in my opinion they're way better tasting than chocolate covered jelly sticks. As I've mentioned before, we're coming to TJ's because we're pretending to be slightly more healthy than folks who shop at regular grocery stores. That whole philosophy comes unraveled if Big Joe tricks us into buying a basket full of chocolate bars before we leave the store. But if Big Joe ensnares us with treats that look semi-indulgent, but are actually nothing but pressed fruit, well then, the guilt-factor disappears. I'm all for being tricked into eating healthier. And sometimes that's the only way I'll eat better. I mean, I realized there was fruit in these bars. But that's all there is. Similar to TJ's new cold pressed juices, there's nothing in these bars but fruit. But in this case, you only have to spend a buck to try the product. The apple banana bar has two ingredients: apples and bananas. The apple mango bar, likewise, has only two ingredients: apples and mangoes. The bars are slightly chewy, and I think that's due to the fact that they're not too dry. They aren't the same as banana chips or dried apple slices. They're way more moist than either of those. But they're not dripping with juice like fresh fruit, either. They're really just bits of fruit bound together by their natural syrupy goodness. They're fairly filling for how small they are, probably due to the 2g-3g of natural fiber in them, although I certainly wouldn't have minded if they were a tad larger. Flavor-wise, you can't expect much more than you'd expect from fresh fruit, although the juices of each ingredient do intertwine and commingle with one another, creating some interesting fruit-salad-esque taste combos not to be found in a lone piece of fresh fruit. I definitely liked the banana flavor slightly better than the mango flavor. I kept wishing the mango bar had chile powder on it. I guess I could have added it myself, but too much of it could have easily ruined the taste. Texture-wise, there were only very subtle differences between the two bars, and quite frankly, I don't even remember which bar we took a picture of to show texture. They both looked really similar. If I had to take a guess, I would say this is the mango bar in the photo. There were a couple of other flavors we haven't tried yet, so if you have any insights about those, please share in the comments below! All in all, this is a TJ's checkout win. Sonia liked them even better than I did, giving them four stars each. I'm gonna go with four stars for banana and three and a half for mango. Bottom line: Trader Joe's Apple + Banana Fruit Bar: 8 out of 10. 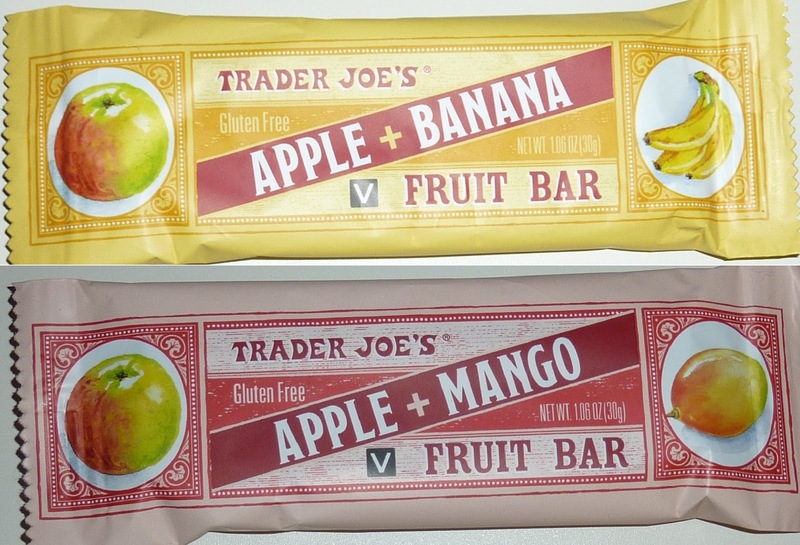 Trader Joe's Apple + Mango Fruit Bar: 7.5 out of 10. I thought the texture of these bars was so off putting that I threw the bar out after one bite. Bummer. Are these similar to Larabars? 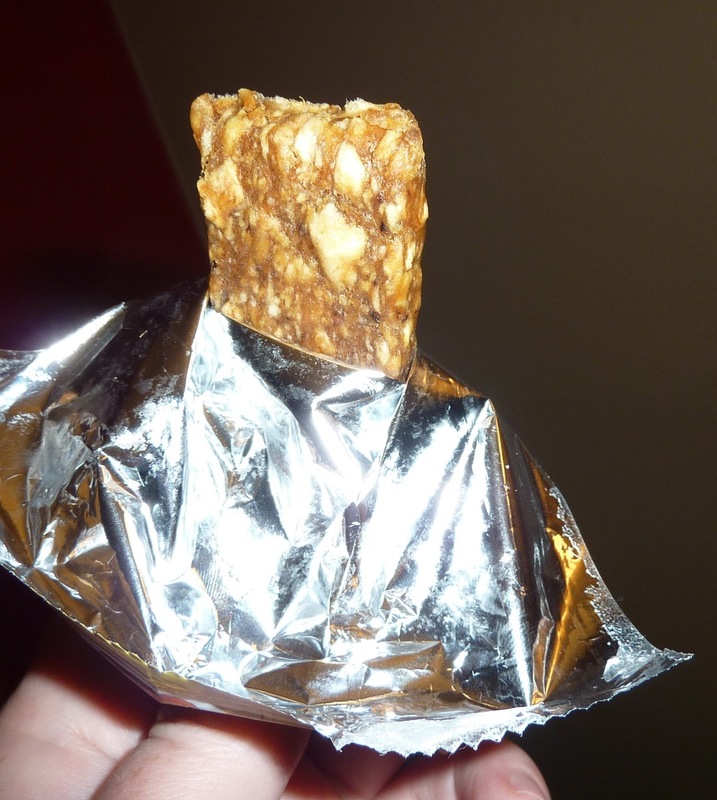 Similar to Larabars, but all Larabars have nuts, which really improves the texture. Since I'm off nuts, I'm happy to have the TJ alternative. The apple strawberry was not my favorite. The apple coconut had a less mushy texture (I'm short on adjectives) and a mild coconut flavor. I'll probably not buy these for me, but maybe if my daughter wanted them.